Detroit-Demolition of the former Cass Technical High School began today on the 1981 addition of the building that housed the athletic wing, cafeteria and some classrooms. It will take about 10 weeks to complete the first phase of the demolition. The second phase to take down the original nearly 90-year-old part of the school will begin in June when students leave campus for summer. The $3.1 million project, part of Detroit Public Schools’ $500.5 million bond construction program voters approved in 2009, includes razing the entire 830,000-square-foot building, cutting and capping off of all utility connections, and targeted salvage of historical building artifacts. The demolition is following strict guidelines of the Occupational Safety and Health Administration to ensure the safety of students in the adjacent structure through June. Once demolition is complete this summer, the site, bounded by Second Avenue, the Fisher Freeway service drive and Grand River Avenue, will become a green space on the campus for outdoor school activities. A permanent perimeter fence will be installed around the grounds that will be backfilled, graded and seeded. 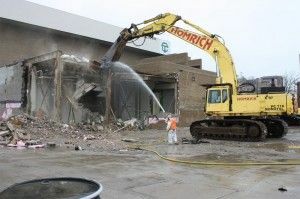 A majority of the demolition work is being performed by 1-Way Service, a Detroit-Headquartered subcontractor of Homrich Wrecking. The original Cass Tech opened in 1922 and was named for Lewis Cass, who served as governor of the Michigan territory from 1813 to 1831. By 1942 the school was the largest in the state with 4,200 students enrolled in the eight-story brick and limestone building. The new school opened in 2005 to replace the older one falling into disrepair. The Office of Public Safety has recorded numerous reports of vandalism after the building was shuttered. The site has also been plagued by numerous fires, including one in 2007 in which two firefighters and two police officers were injured. Two entry arches, plaques, a relief sculpture, bricks and other artifacts will be salvaged. Detroit voters approved Proposal S in Nov. 2009 which enabled the district to access $500.5 million for school capital improvement projects. DPS received the sixth largest allocation in the nation. The improvement program also technology upgrades and security initiatives being funded with Proposal S dollars. To comply with federal guidelines, all bond dollars must be spent within three years and all projects must be completed by September 2012. This entry was posted in Info News Center, News and Press Releases and tagged 510, Emergency Manager.